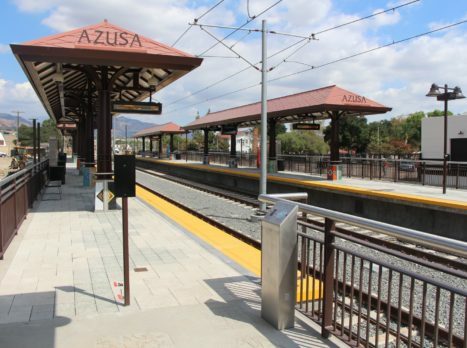 The city of Azusa is home to two Gold Line stations as part of the Foothill Gold Line from Pasadena to Azusa, completed on time and on budget on September 23, 2015 and turned over to Metro. 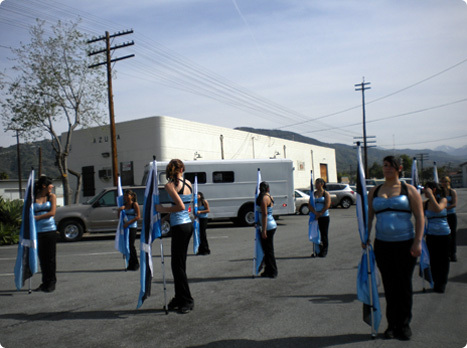 One, Azusa Downtown, is located in the heart of the city’s downtown and the other on the eastern border of the city near Azusa Pacific University and Citrus College (APU/Citrus College Station). Passenger service began on March 5, 2016. 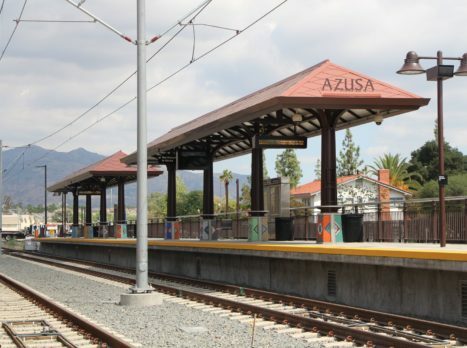 The Azusa Downtown station is located east of Azusa Avenue, and consists of side platforms with the track in the middle. 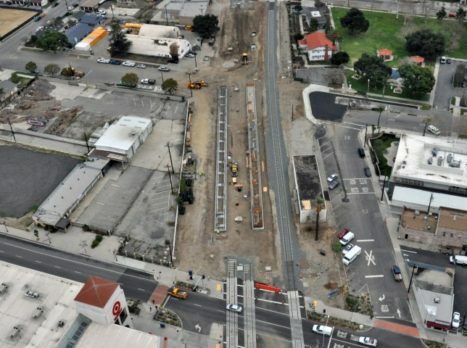 As part of the project, Alameda Avenue was permanently closed to accommodate the new platforms. 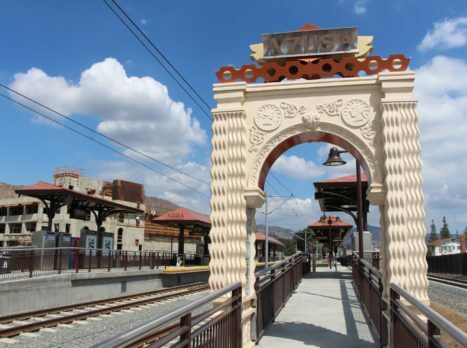 Although directly adjacent to the historic Sante Fe Depot, the Azusa Downtown station does not include use of the historic structure. 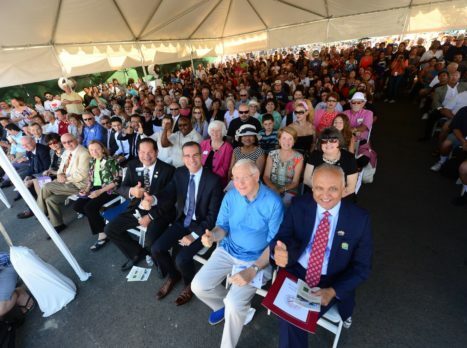 At this time, plans for the historic depot have not been finalized. 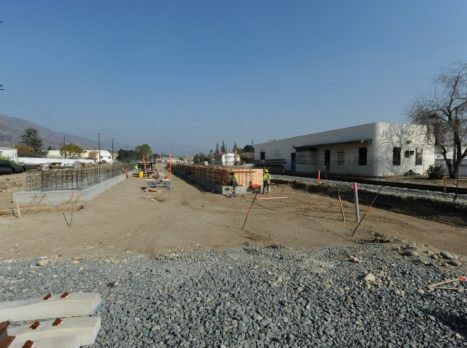 Foothill Transit, a public transit provider servicing the San Gabriel and Pomona Valleys, is currently constructing a multi-story, 550-space parking structure in the City of Azusa. 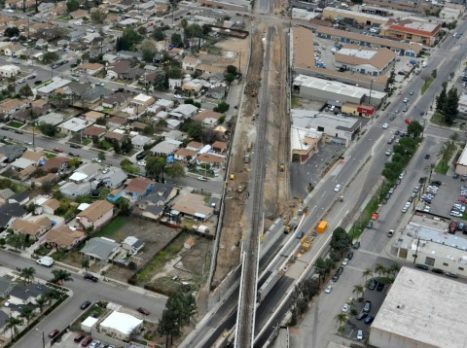 The structure, which is to be located adjacent to the Azusa Downtown Gold Line Station, will provide parking spaces for Metro Gold Line passengers, Foothill Transit and the city. 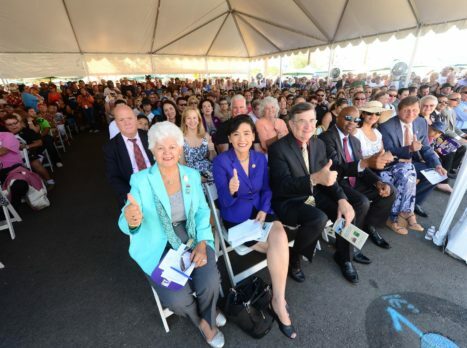 For more information on the parking structure, please click here. 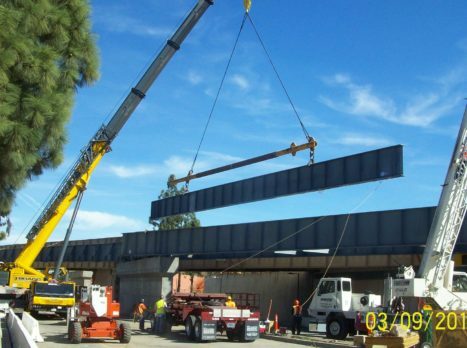 Questions about construction? 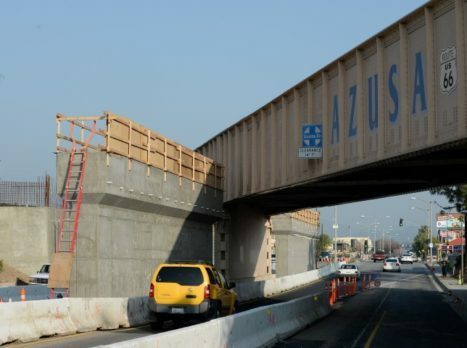 Contact Martin Quiroz, Public Information Officer, City of Azusa, at (626) 812-5178 or mquiroz@ci.azusa.ca.us. 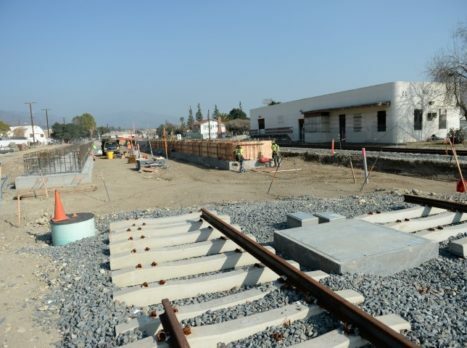 Throughout Azusa, the two light rail tracks will share the corridor with one freight track. 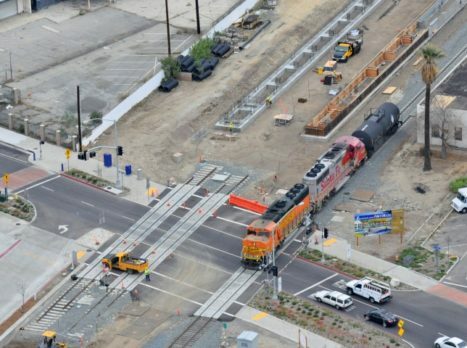 Although built within the same corridor, freight and light rail trains will not share tracks. Rugged mountains and foothills form a spectacular backdrop to a community where ancient peoples lived more than 6,000 years ago. From the snow covered peak of Mt. San Antonio towering over 10,000 feet, the San Gabriel River drains a watershed of more than 600 square miles. 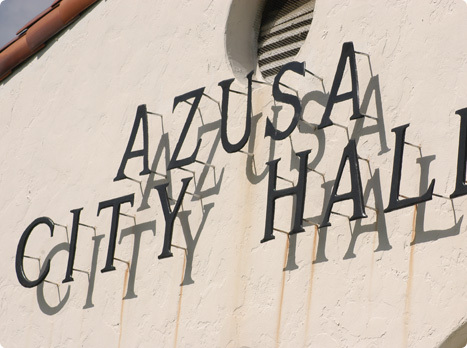 The City of Azusa was founded in 1887 and incorporated as a general law city on December 29, 1898. 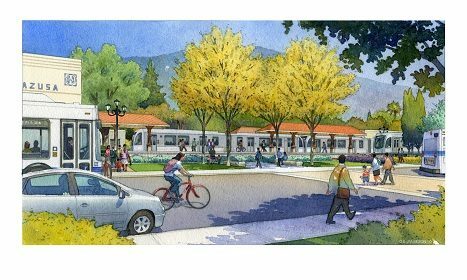 Today, Azusa is a model older suburban community undergoing growth and rejuvenation, located 26 miles east of Los Angeles. 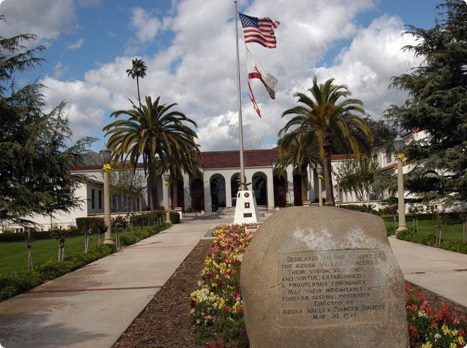 Situated at the base of the San Gabriel Mountains, it has nearly 50,000 residents and is home to Azusa Pacific University. The pristine areas of river flood plain create corridors of wetlands for wildlife and fish, including steelhead trout. Tributary streams are lined with willow, cottonwood, sycamore and alders. Higher up are mountain forests, home to bobcats, mountain lions and bears. 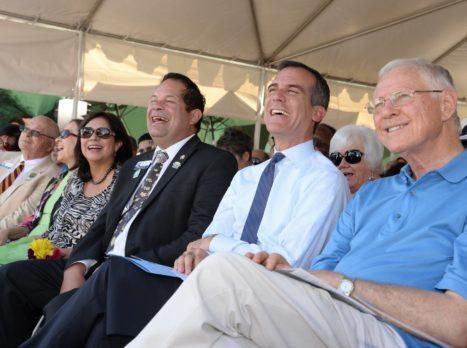 This not only provides a diverse and spectacular backdrop to the city, but a destination for recreation, mountain biking, hiking and fishing. 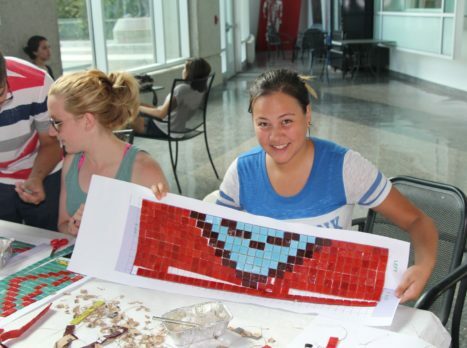 Although officially located in the city of Glendora, Citrus College sits just beyond the eastern border of Azusa and is a beloved neighbor to the city. 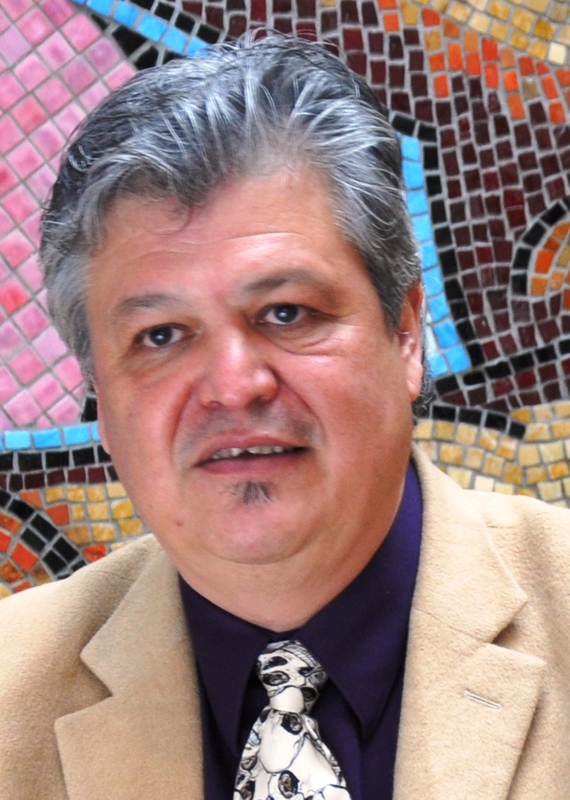 Jose Antonio Aguirre is recognized as a bi-national artist, who was born and raised in Mexico City and immigrated to the United States in 1976. 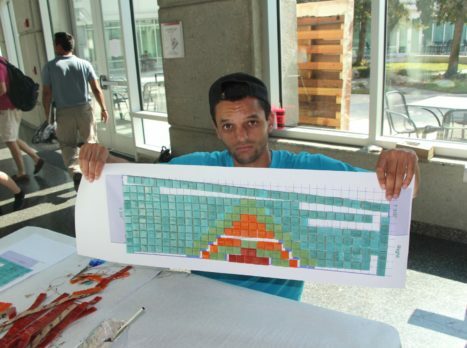 During the 1980s, Jose achieved a B.F.A. 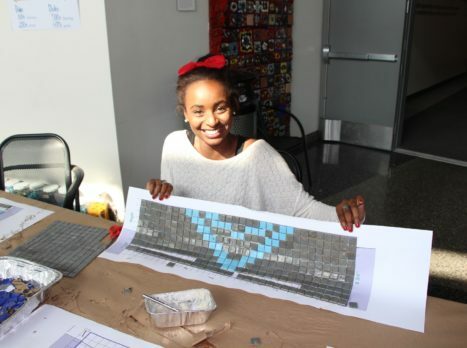 from the Art Institute of Chicago and then an M.F.A. from the California Institute of the Arts in 1990. 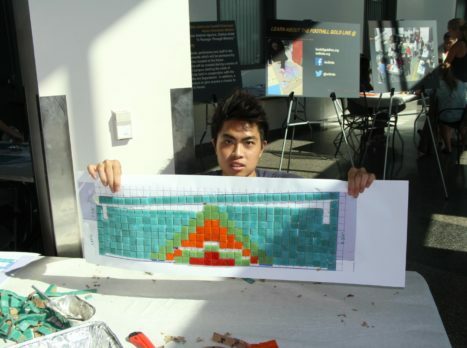 Jose has continued to live and work in Los Angeles, developing a national and international art career. 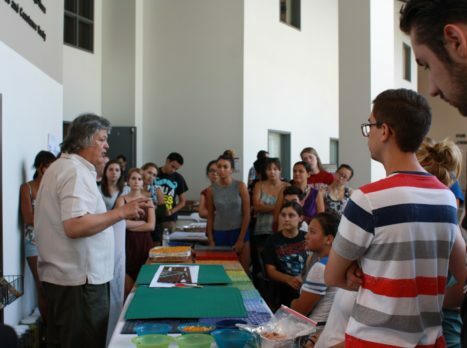 He has actively participated in solo and group exhibitions, but he is particularly recognized for his public art. 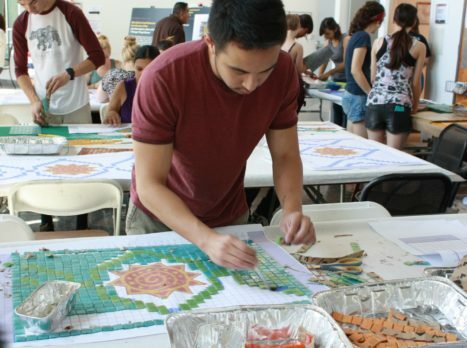 His most ambitious project is the double-tower Byzantine and Venetian glass mosaic mural for the new East Los Angeles Public Library, titled, “Our Legacy, Forever Presente.” The project was commissioned by the County of Los Angeles at the behest of Los Angeles County Supervisor Gloria Molina. 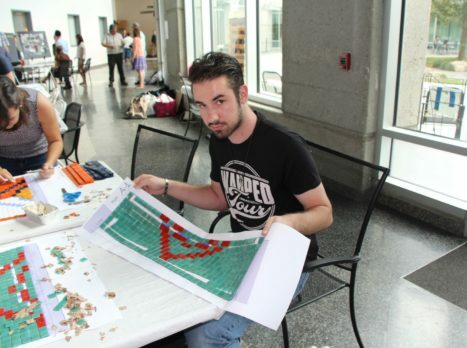 Jose creates his public and private art, not only as an artist, but also as an active community cultural worker, a cultural journalist and a visual arts educator. 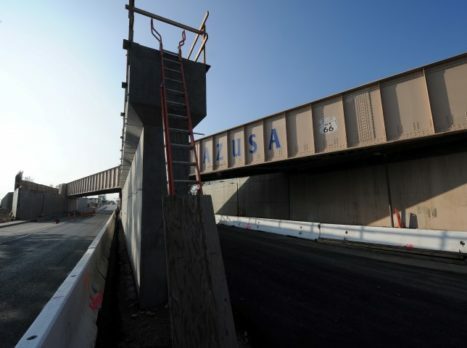 His two-dimensional artworks are included in many of the prominent public art collections in the United States, Mexico, Scotland and Germany. 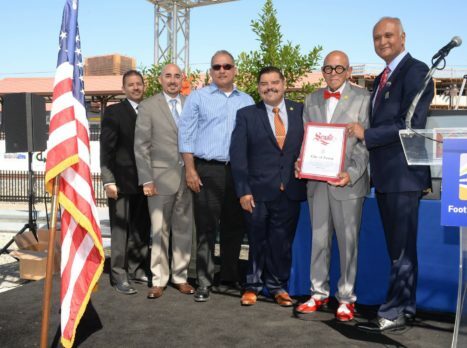 Jose Antonio Aguirre developed a concept for the station that will serve as both a historic landmark and a gateway for the City of Azusa. 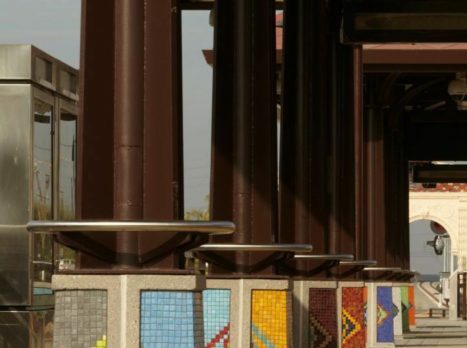 The station’s architectural and artistic design elements are to reflect an integration of motifs and pictographs drawn from the cultural traditions of the Native American Gabrielino tribe and the architectural forms of the early California Spanish-Colonial Mission style. 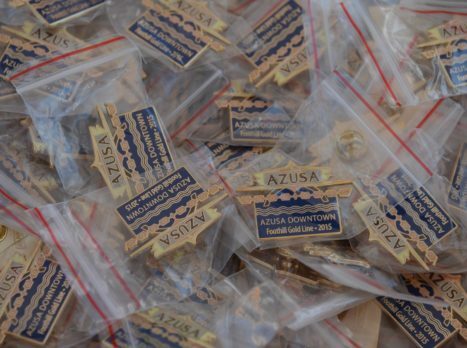 The fusion of the two histories will capture the cultural significance of the local area reflected in the civic identity of the City of Azusa. 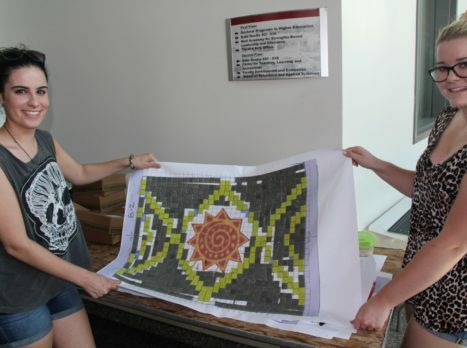 As part of the development of the final design concept for this station, the artist has used some of the standard station finishes to distinguish a specific place along the alignment. 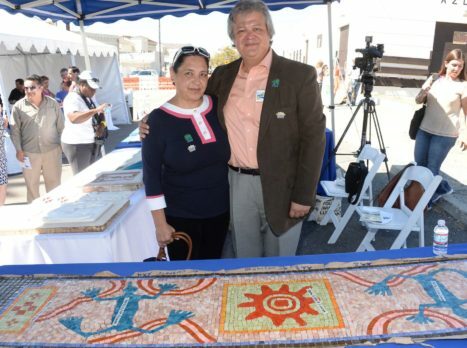 Beginning at the access ramps to the station platforms, the artist has developed concrete stencils that are interpreted pictographs of the Gabrielino culture. 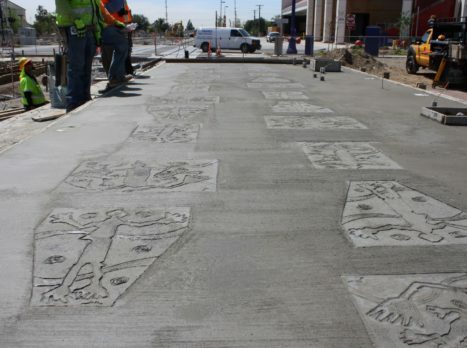 The combination of the three stylized motifs will bring an abstract surface texture to the ramps, which over time will reveal themselves to be the elusive rock painting of early inhabitants of the area. 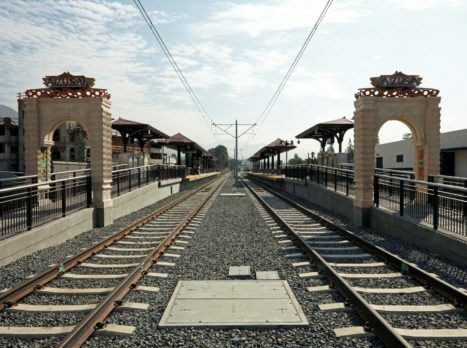 Mr. Aguirre has also used standard paving materials for the platform and enhanced them by the inclusion of larger local aggregate with a heavier sand blast finish to depict a dry river bed surface that flows down the entire center section of the platforms in a meandering pattern. 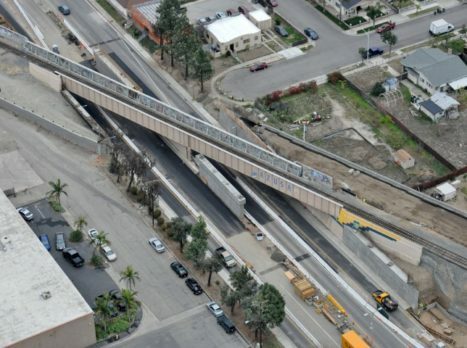 Perhaps the most ambitious and sculptural feature of the Azusa Downtown station is the unique arched portal gateway structure to signify the Alameda, or the Grand Parkway, to the community. 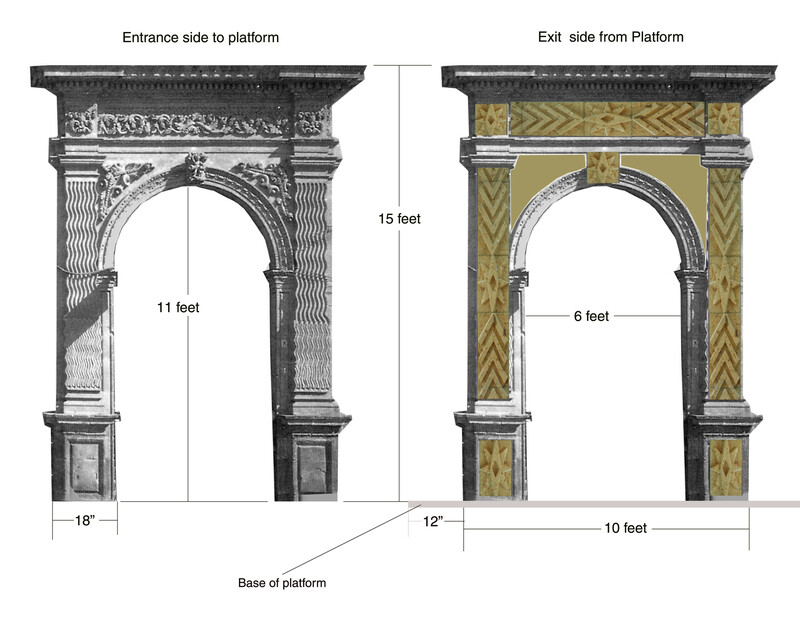 This portal will be placed on the ramp of the northbound platform. The Spanish colonial-style archway is approximately 16 feet from ramp to top. The arched section of the portal is made from architectural concrete. 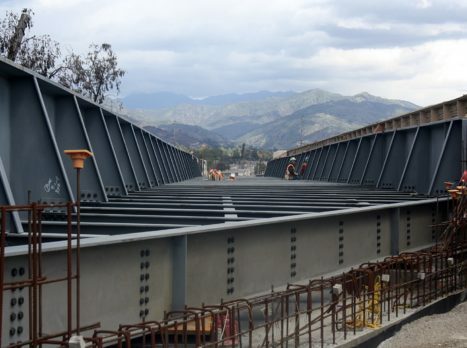 The top of the portal shall be made of metal and will be illuminated at night, casting a glow that will back-light the word “AZUSA”. 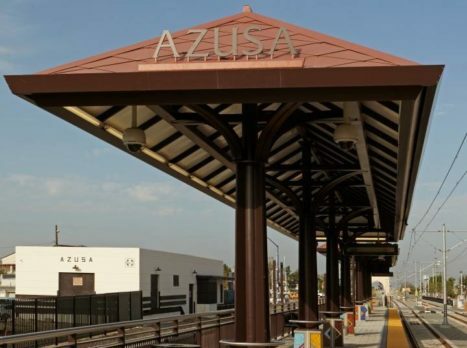 This metal crown of the structure is inspired by the original “AZUSA” sign located on Foothill Boulevard and created in 1923. It was eventually removed from the site in 1946. 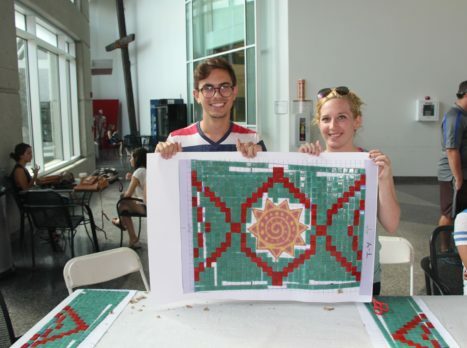 The final element unique to this station is the inclusion of hand-made mosaic compositions that are inspired by basket weavings from the local tribes of the San Gabriel Valley region. 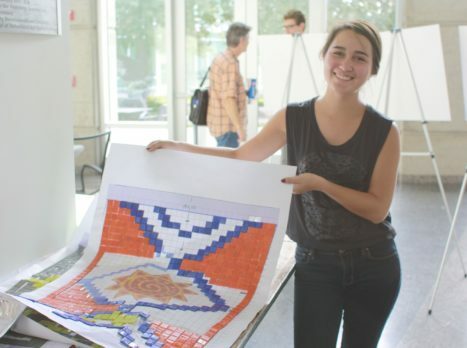 The artist seeks to include the public in the design developmental stages and final creation of the custom mosaics that will be installed on the canopy column bases of both platforms. 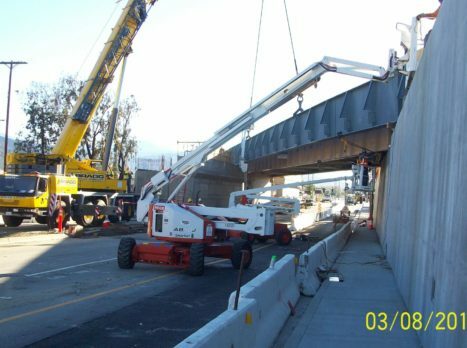 The Foothill Gold Line from Pasadena to Azusa (Pasadena to Azusa) broke ground on June 26, 2010 and was completed on time and on budget on September 23, 2015. 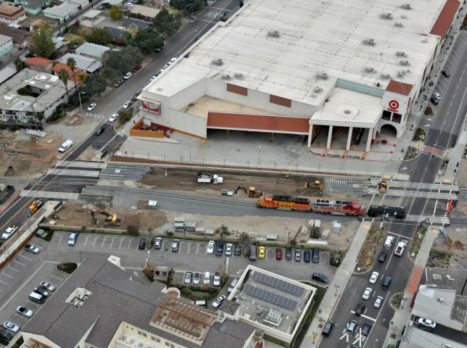 The 11.5-mile, six-station extension was then turned over to Metro. Passenger service began on March 5, 2016.